Feedback is one of the most powerful influences on student achievement, yet it is difficult to implement productively within the constraints of a mass higher education system. Designing Effective Feedback Processes in Higher Education: A Learning-Focused Approach addresses the challenges of developing effective feedback processes in higher education, combining theory and practice to equip and empower educators. It places less emphasis on what teachers do in terms of providing commentary, and more emphasis on how students generate, make sense of, and use feedback for ongoing improvement. Supports higher education teachers in further developing their feedback practice. 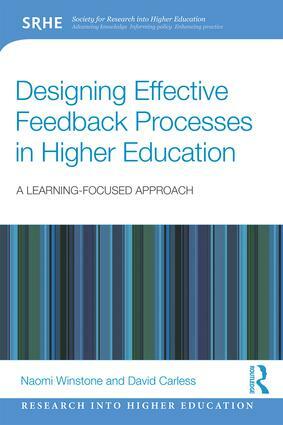 Designing Effective Feedback Processes in Higher Education: A Learning-Focused Approach contributes to the theory and practice of higher education pedagogy by re-evaluating how feedback processes are designed and managed. It is a must-read for educators, researchers and academic developers in higher education who will benefit from a guide to feedback research and practice that addresses well recognised challenges in relation to assessment and feedback. Naomi Winstone is a Senior Lecturer in the Department of Higher Education at the University of Surrey, UK. Naomi is a cognitive psychologist specialising in learning behaviour and engagement with education. Naomi’s research focuses on the processing and implementation of feedback. David Carless works in the Faculty of Education, University of Hong Kong. His signature publication is the book Excellence in University Assessment: Learning from Award-winning Practice (2015) published by Routledge.